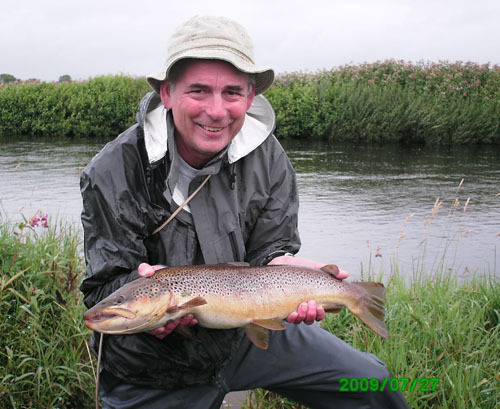 Contact Andy Dickson, Sec/Treasurer 01683 300592. 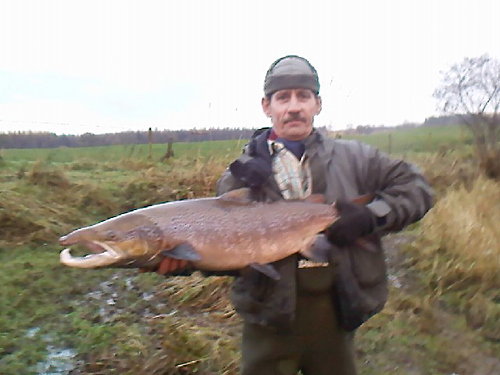 Mobile 07971 764022. 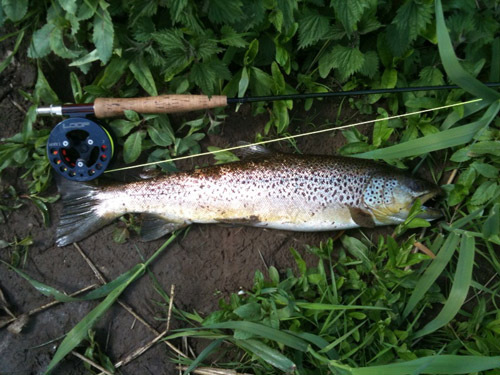 E-mail andy.dickson1@yahoo.co.uk for updates on conditions or for permits, or just for a chat about the fishing - afternoons or evenings are best. 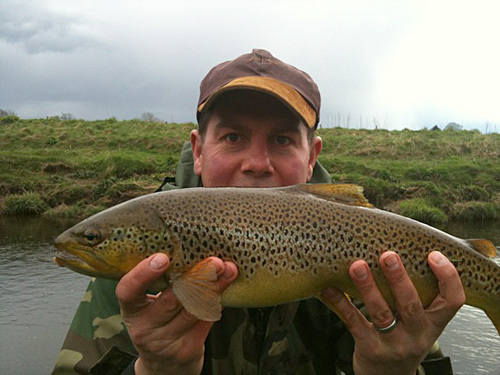 John Bamford report, 11th May, 2012, Upper Beat. 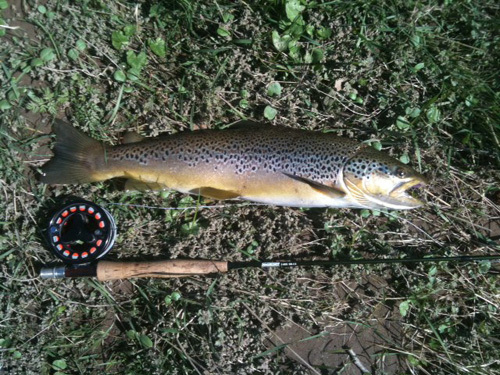 Brown Trout of well over 6 pounds and not many would argue with 8 pounds. 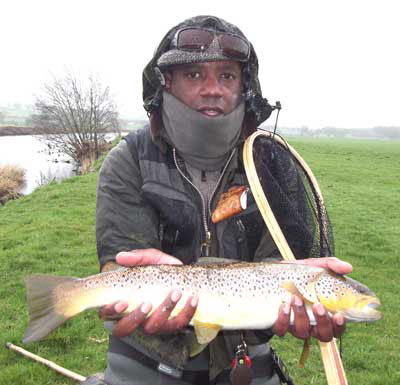 Anglers name was Andrew. 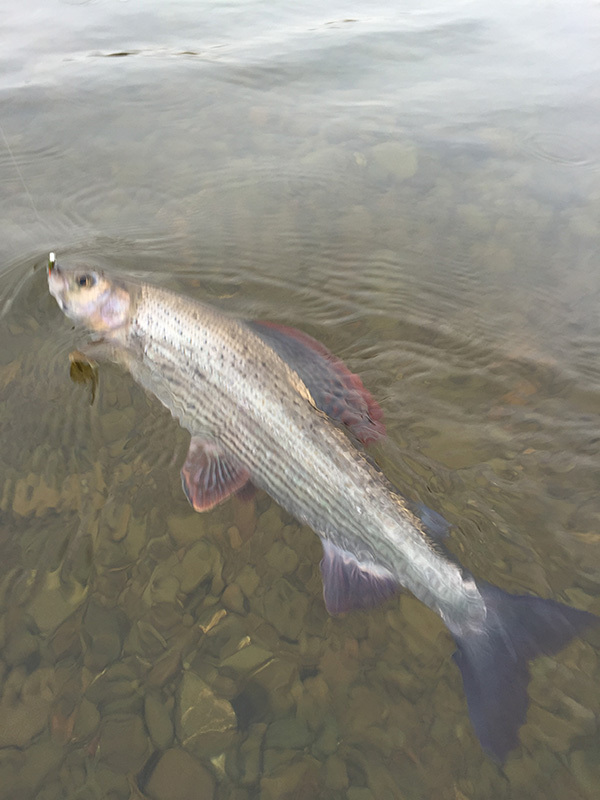 Safely returned. 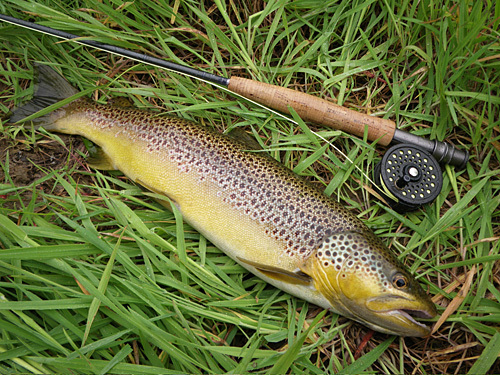 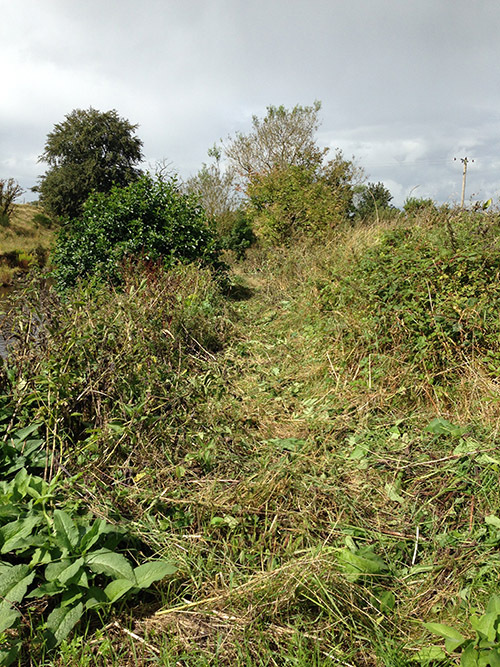 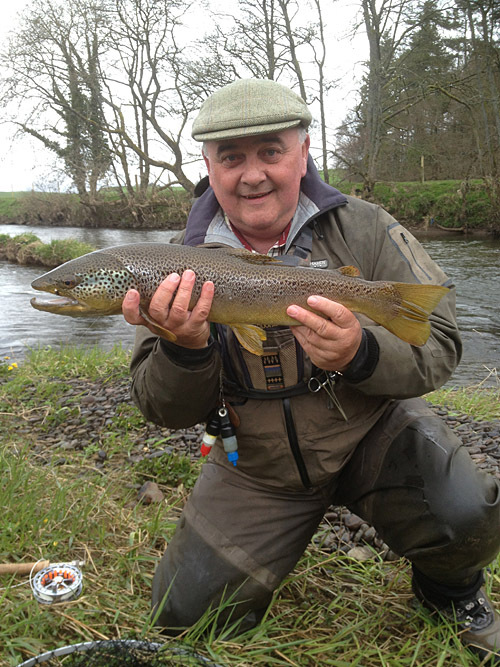 There are a LOT of BIG Brown Trout in Annan, although 4 to 5 pounders are a bit more common than 7 and 8's!!! 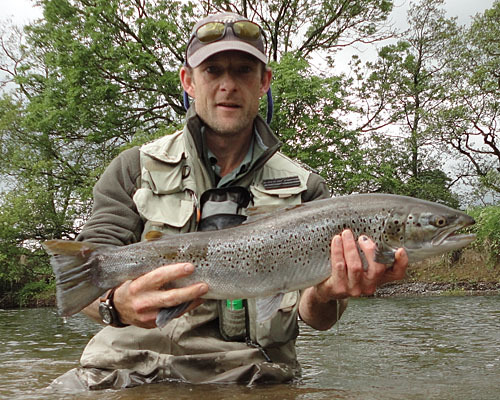 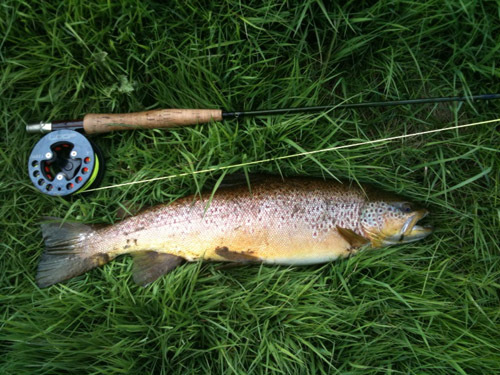 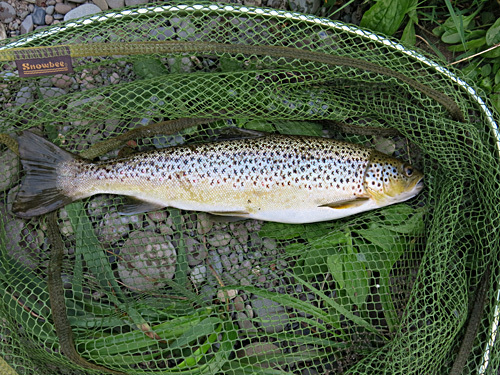 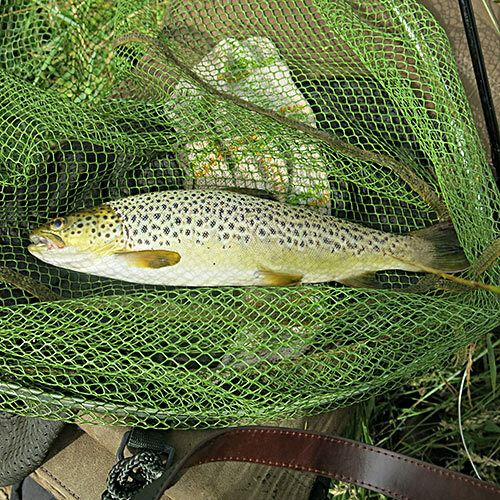 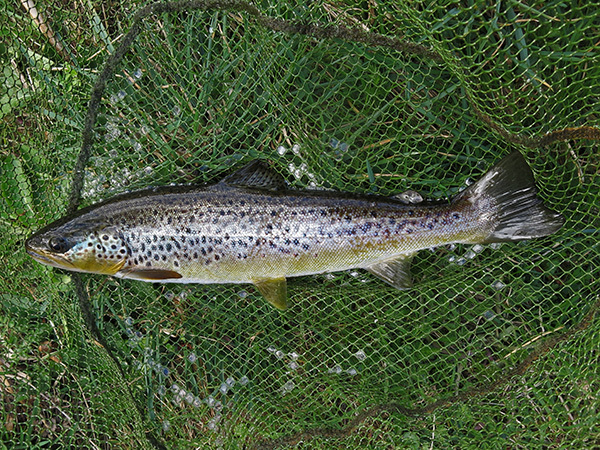 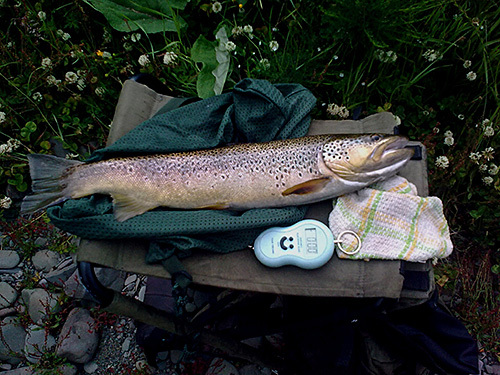 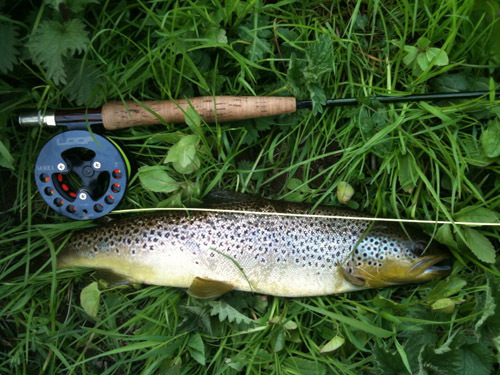 Neil Alston, evening of Wednesday, 4th July, 2012, Upper Beat, 4 pound Sea Trout on black snaelda conehead and safely returned (Google snaelda - I did) Says here it looks like a Bassett's Liquorice Allsort!! 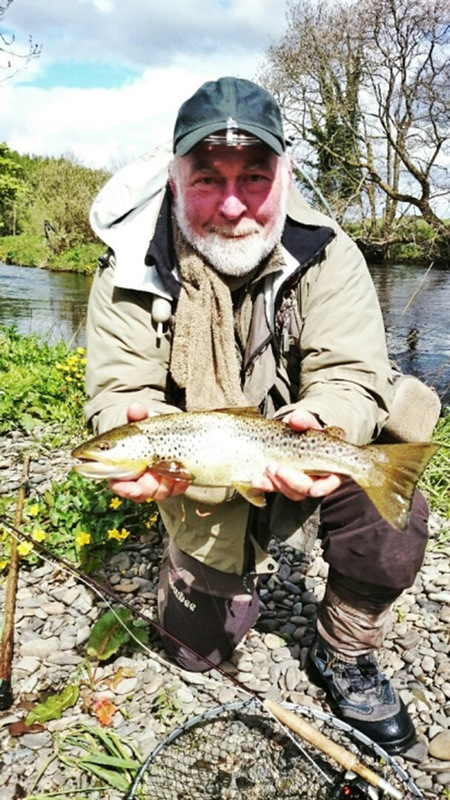 He was first surprised and then delighted!! 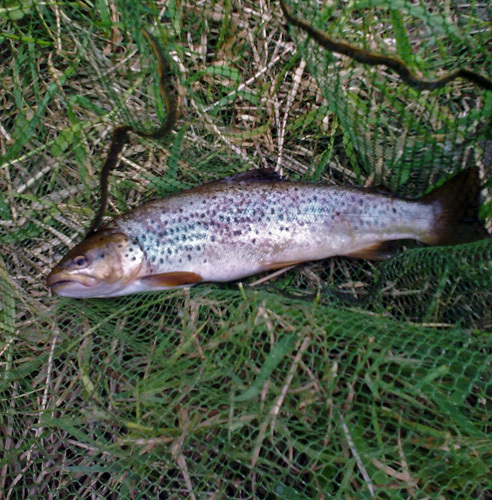 First a 2 to 3 pounder and then a 5 to 6 pounder!! 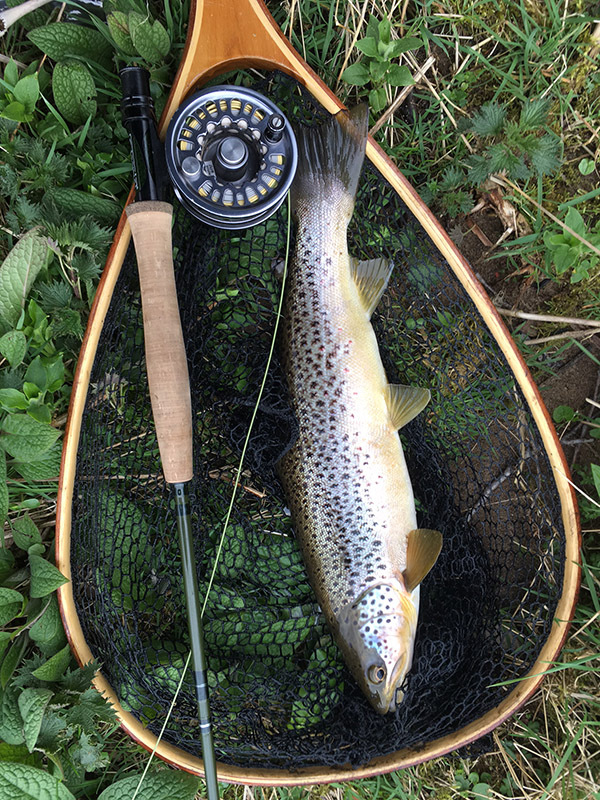 No weight given but looks to be 3 pounds plus! 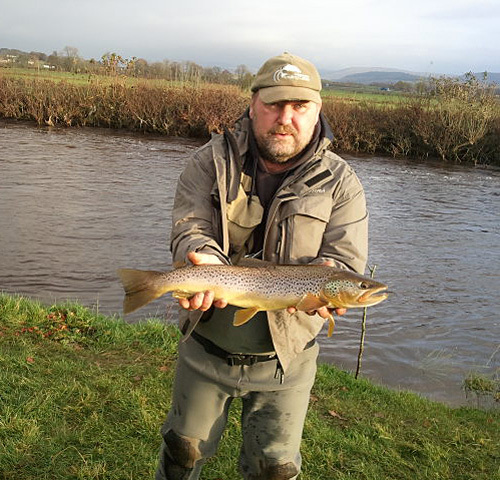 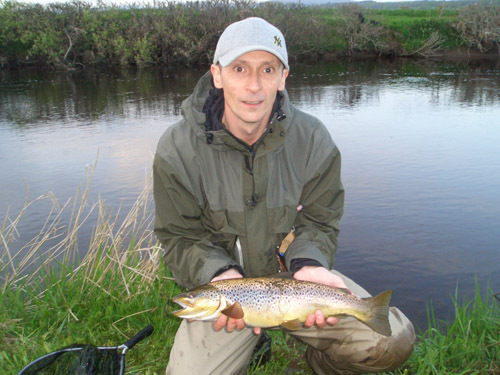 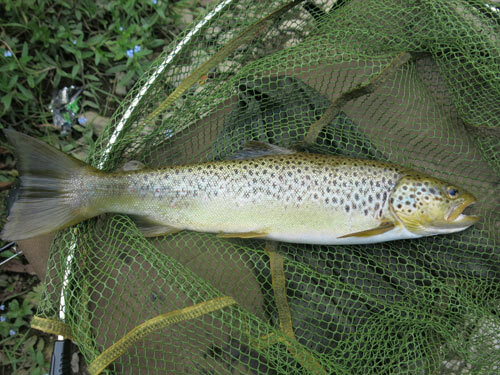 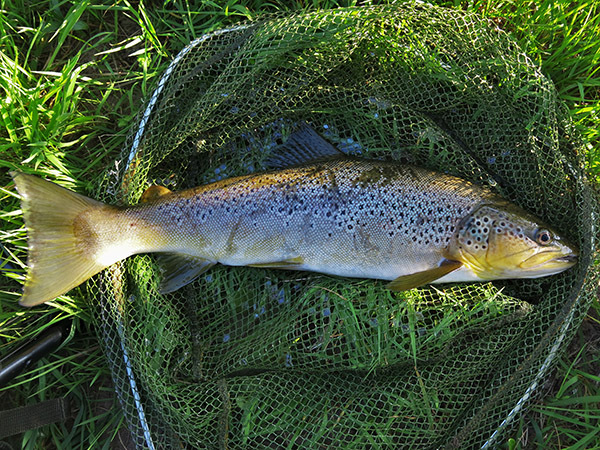 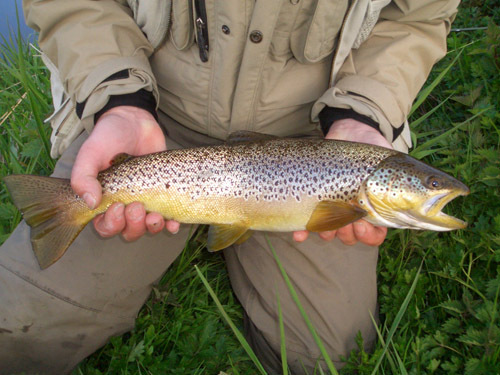 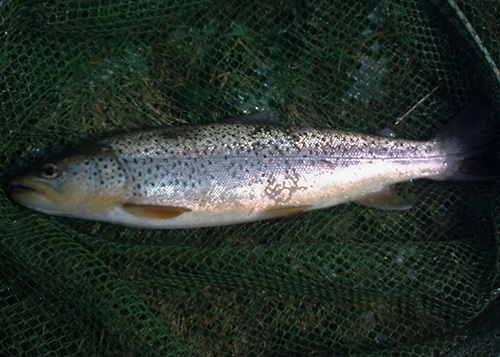 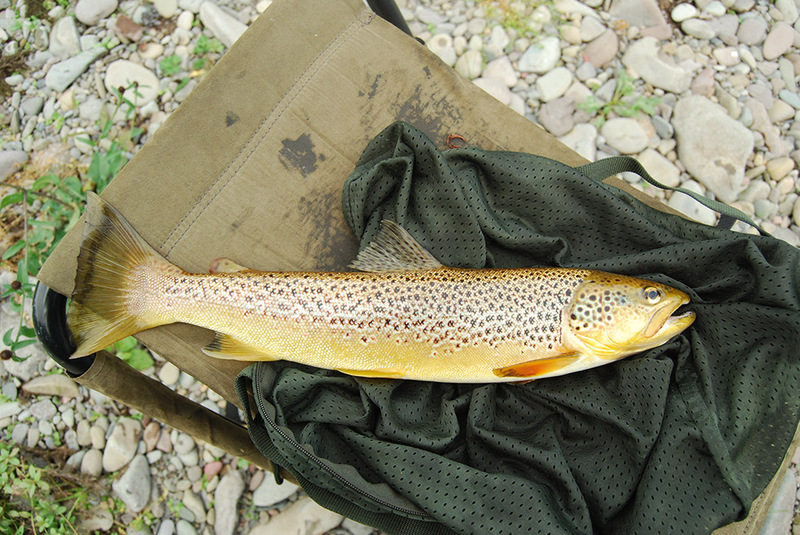 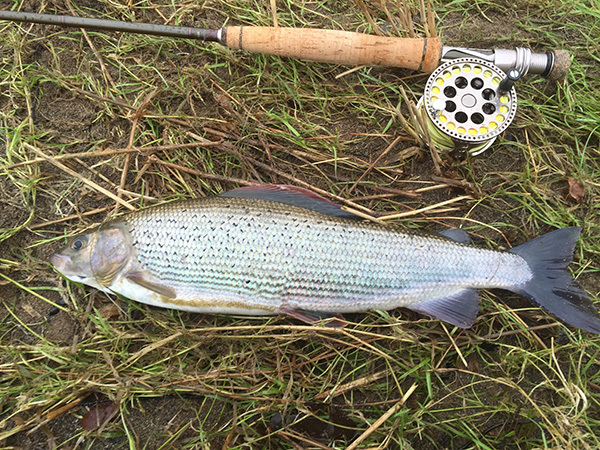 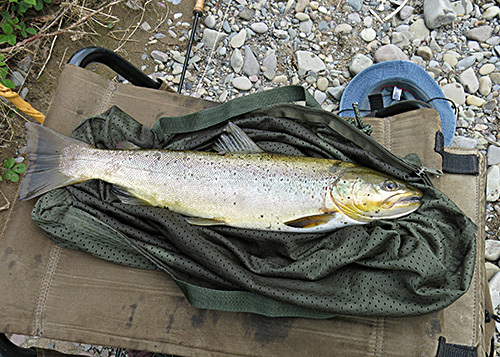 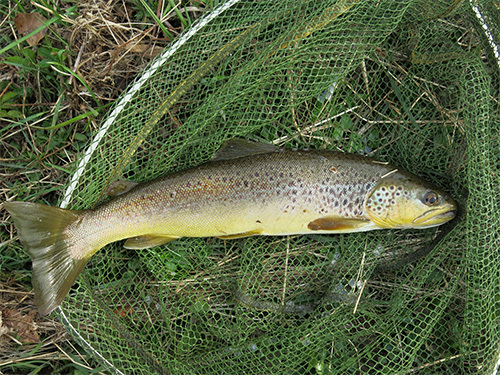 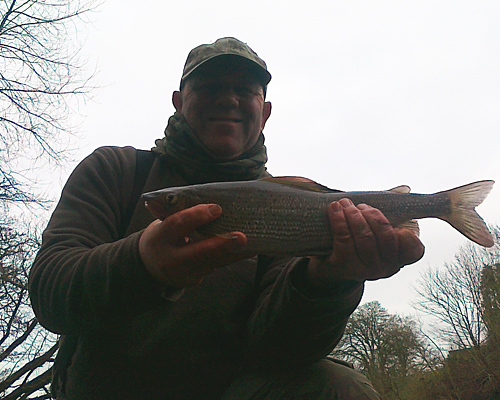 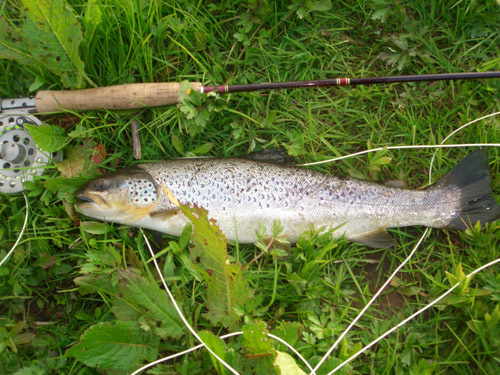 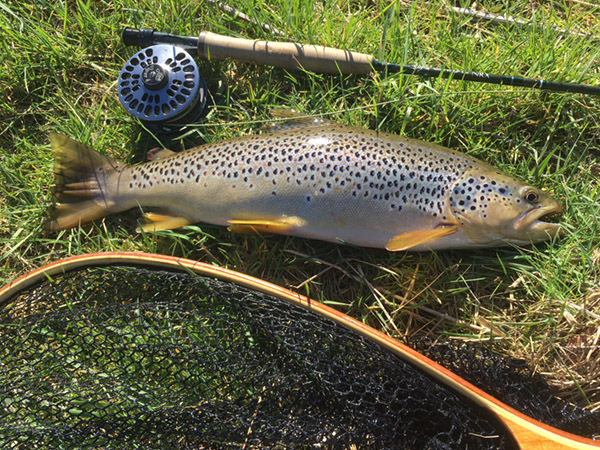 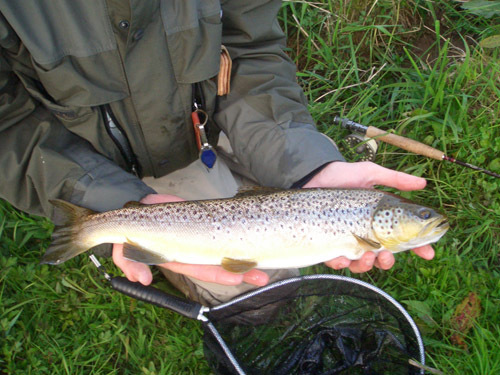 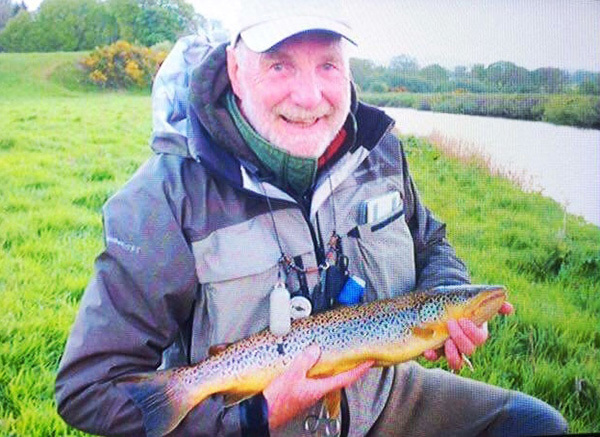 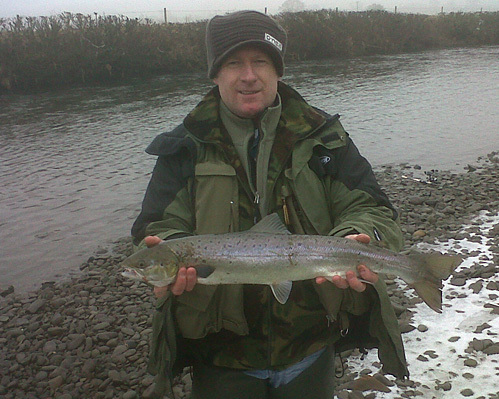 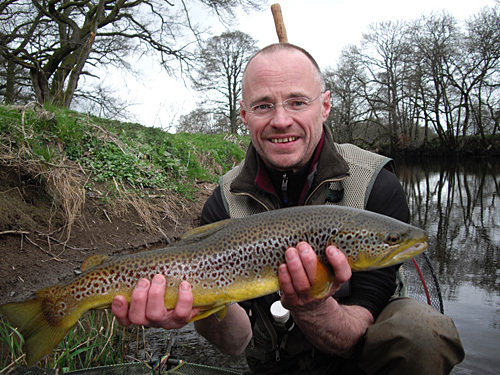 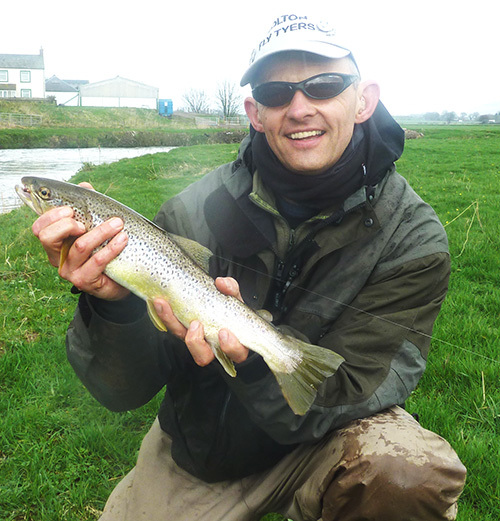 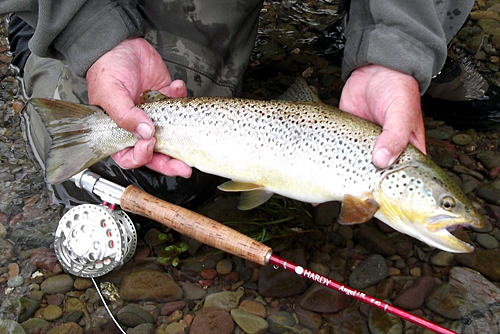 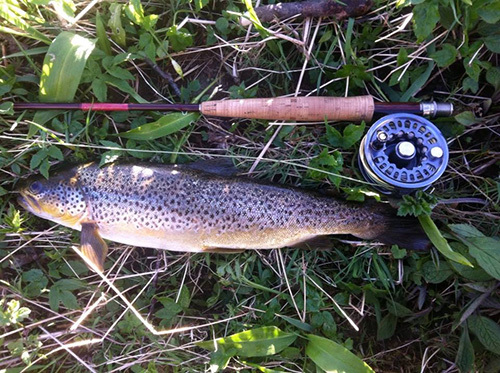 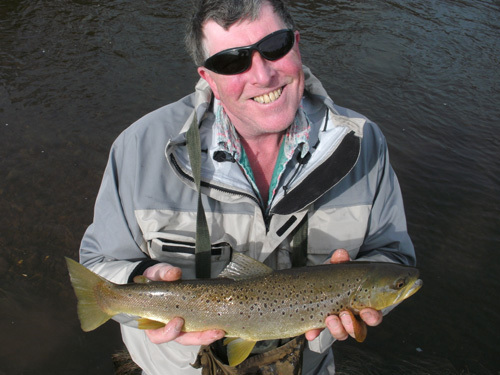 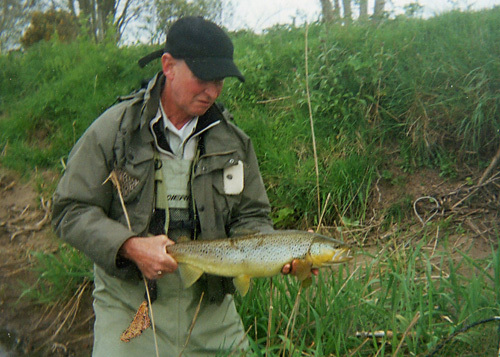 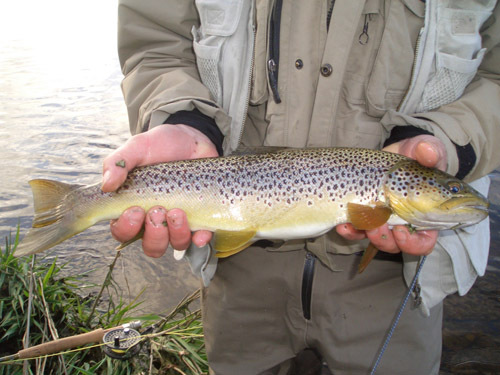 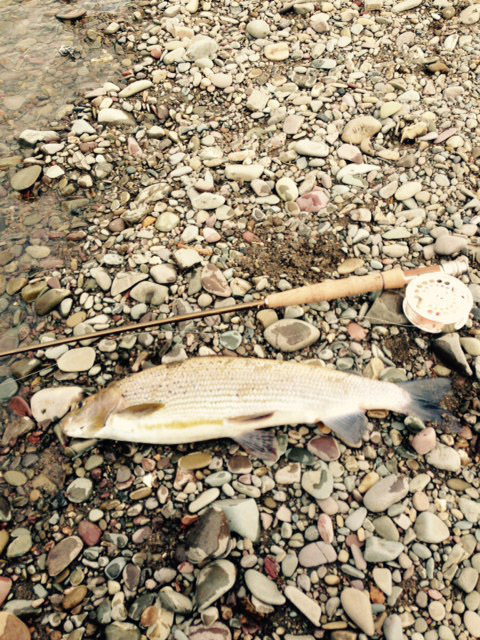 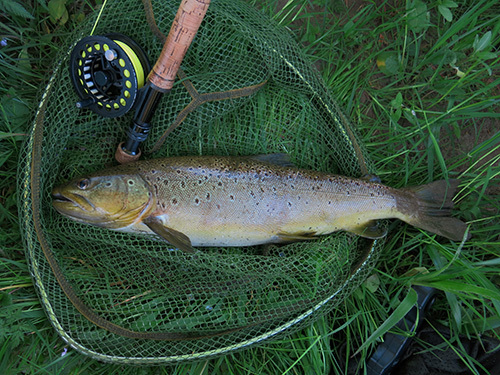 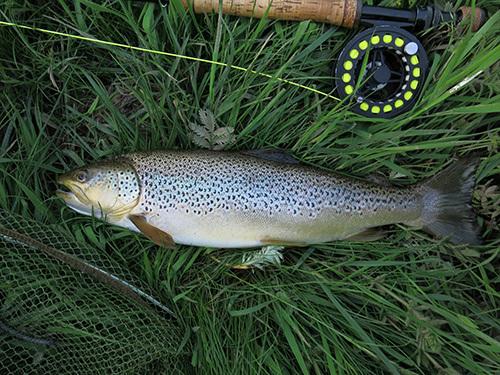 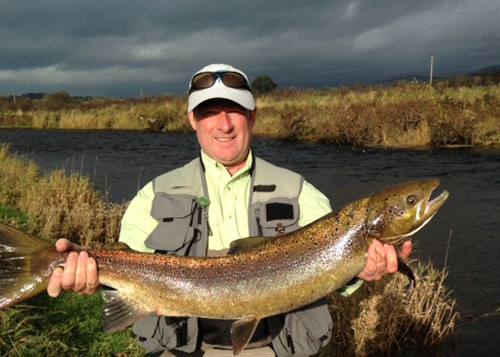 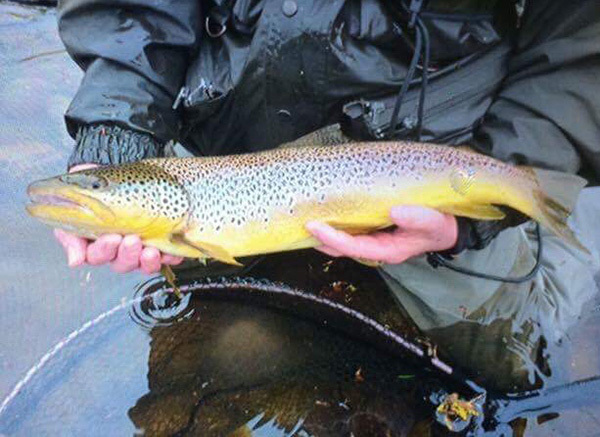 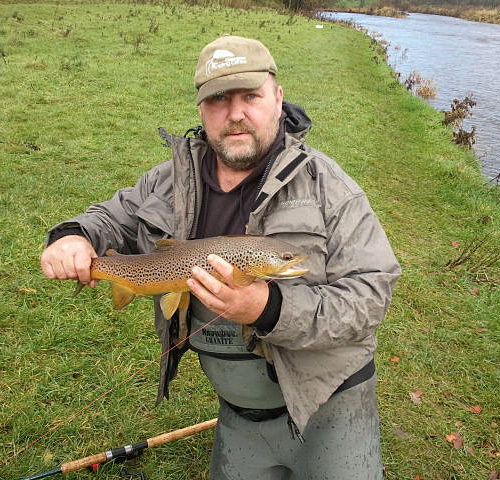 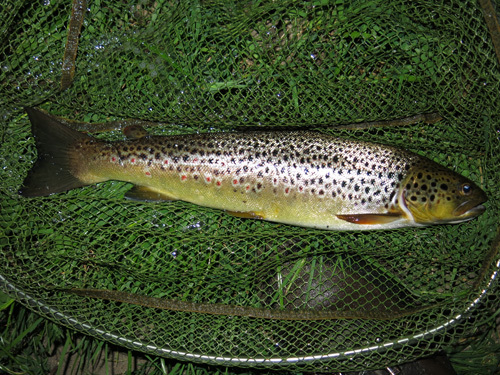 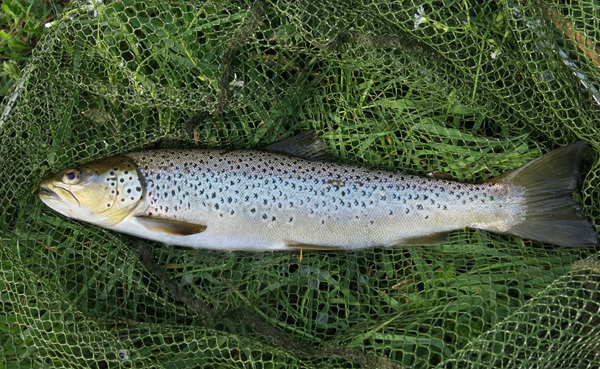 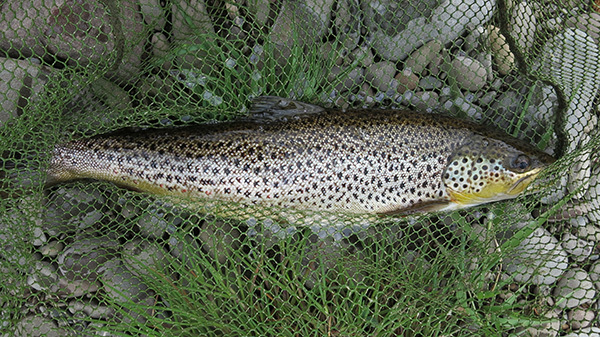 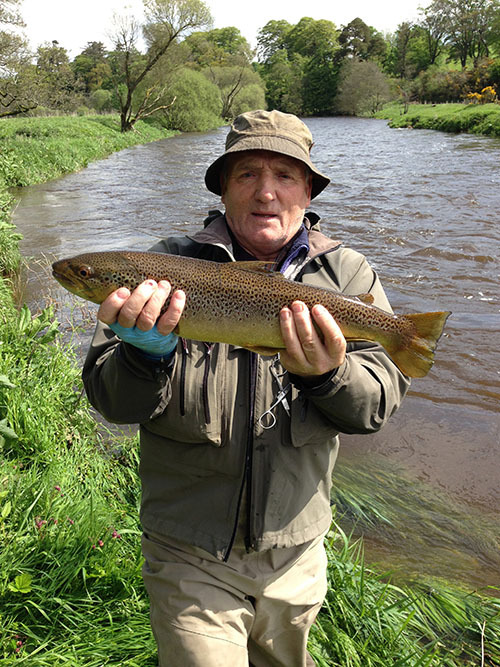 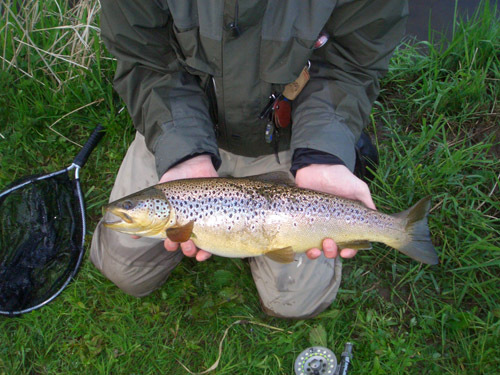 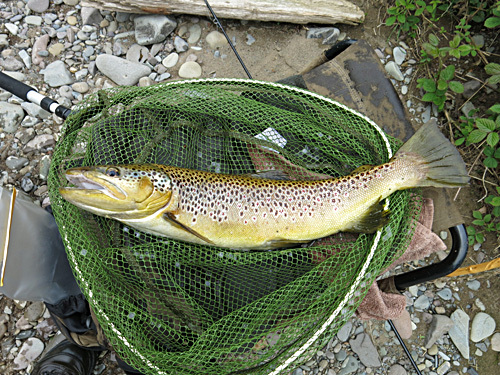 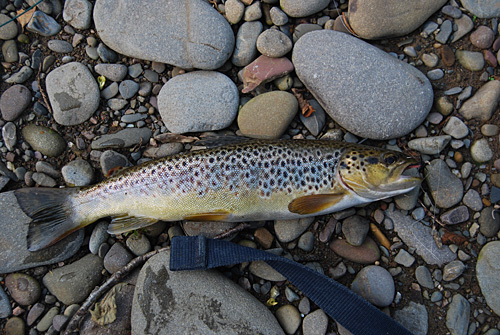 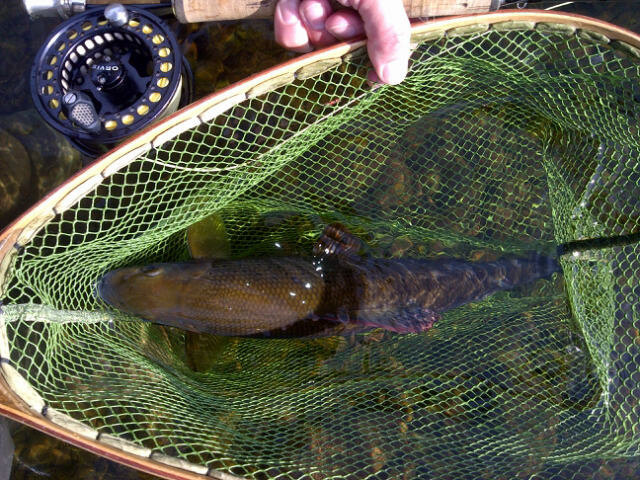 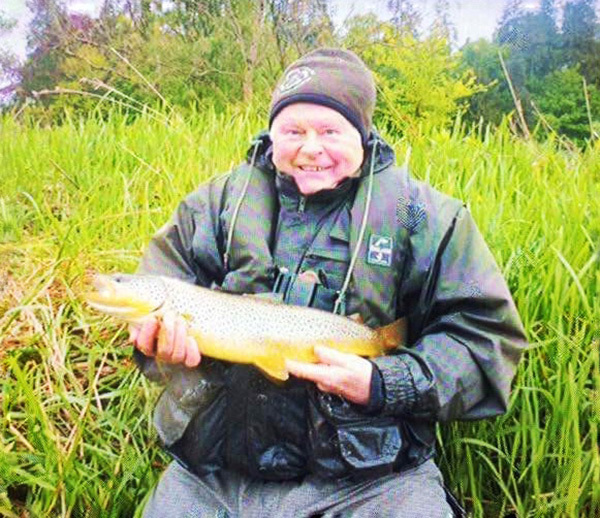 Brian Hastie Had a nice 20 incher from the pot Hole on Upper Beat on Friday, 15th April, 2011 and of course all Brown Trout are catch and release throughout the season so these fish are still there waiting for you and there are BIGGER ones!! 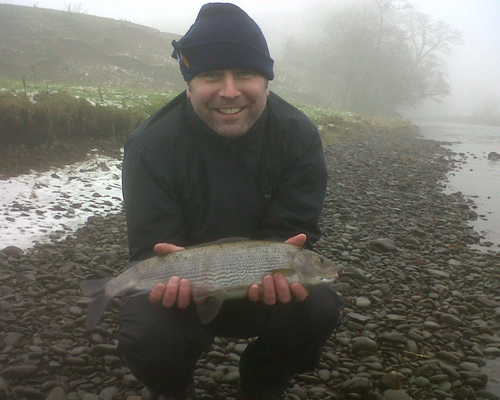 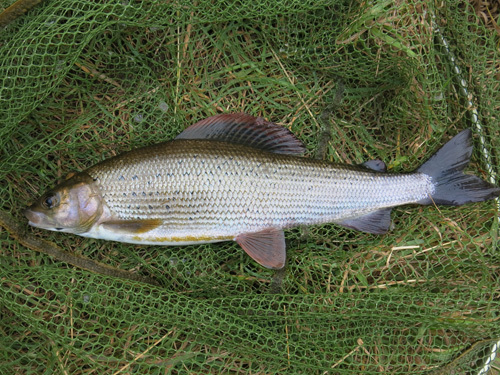 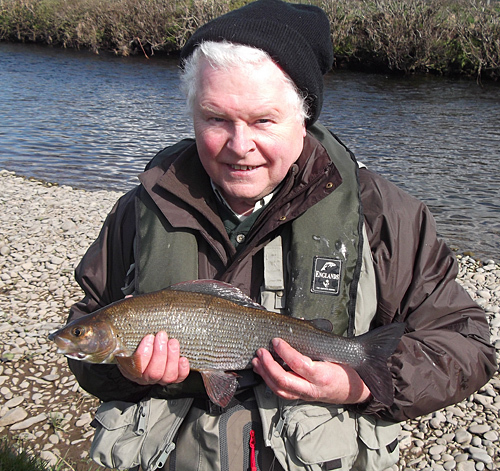 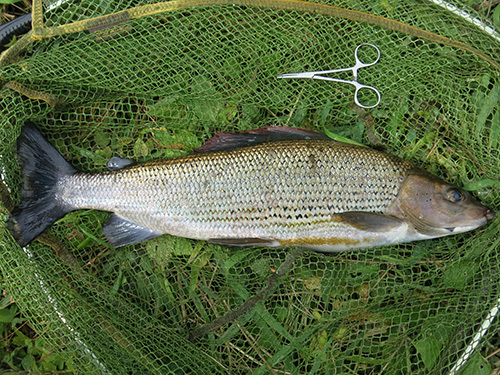 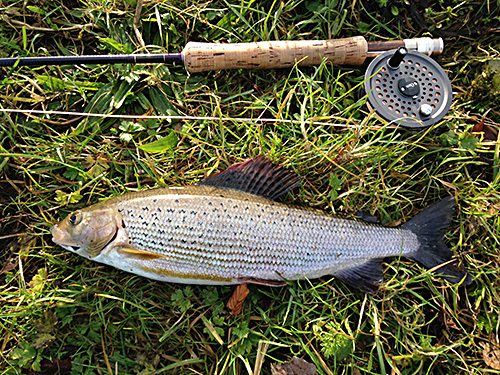 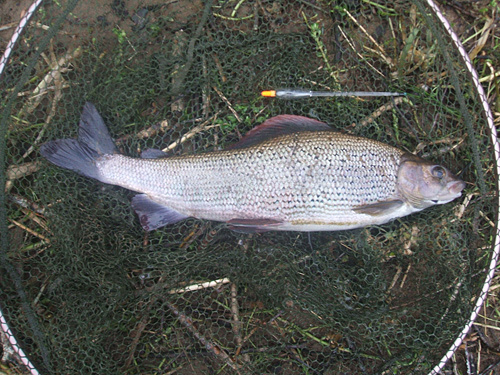 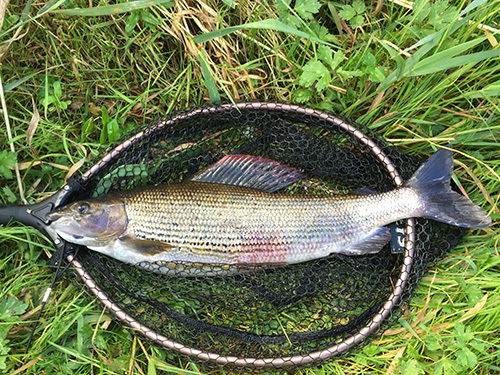 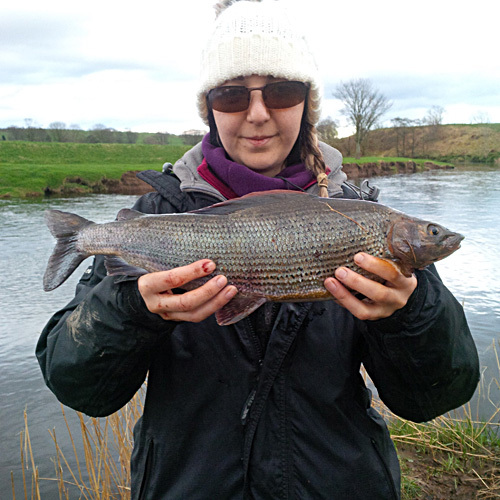 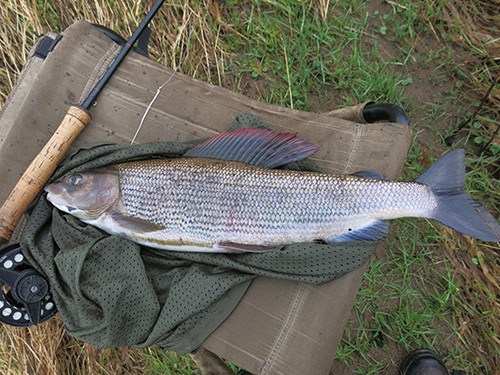 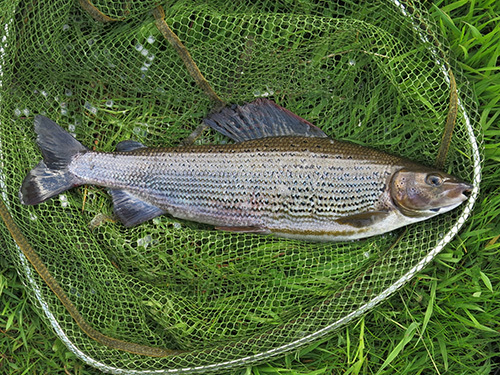 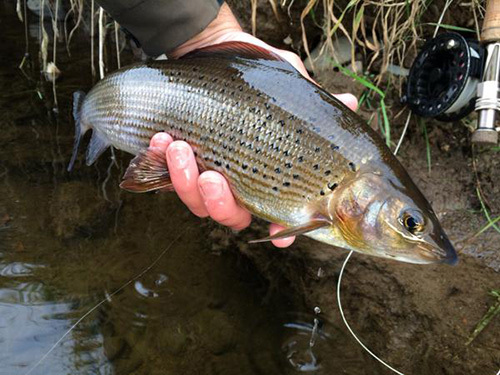 John Arkwright, fishing Applegarth near Millhousebridge on Saturday, 28th January, 2012 had Grayling of 2 pounds and 3 pounds long trotting. 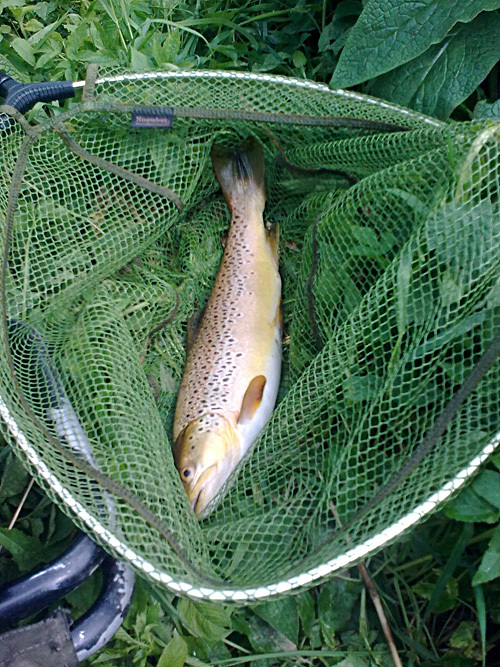 This is the smaller one. 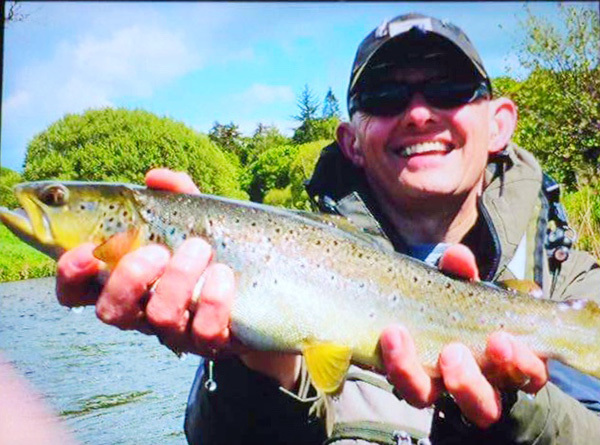 Meanwhile another angler, Kenny Halley, fishing near the top of the beat had an epic struggle on fly with a lady of 3 pounds 4 ozs, which he videoed, only he didn't cos the camera was set just a little too high. 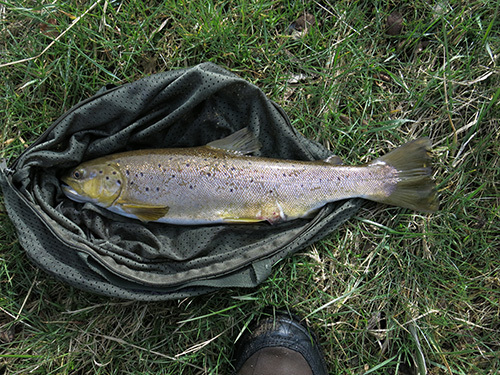 You may have heard the screams of anguish coming down the wind when he realised!!! 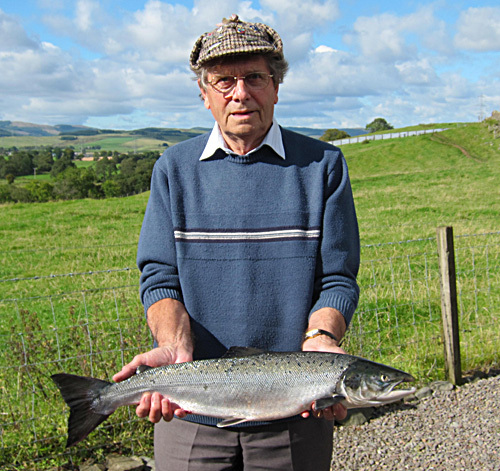 Willie Adamson's Surprise! 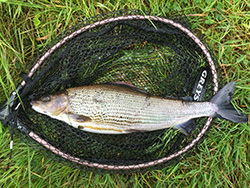 Applegarth Beat February, 2012, three pound line, size 16 hook and a couple of maggots long trotting for Grayling, 5 pound salmon - ok its a Kelt but even so!! 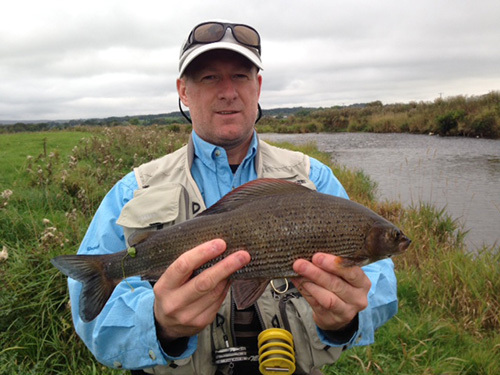 Dave went to fish the Plum, Upper Beat on Thursday, 5th September, 2013. 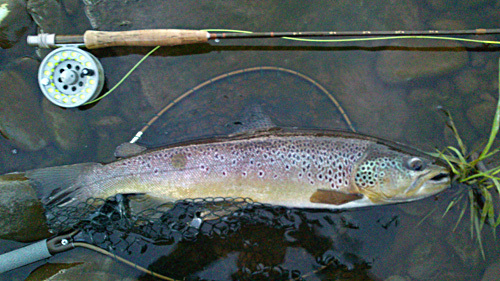 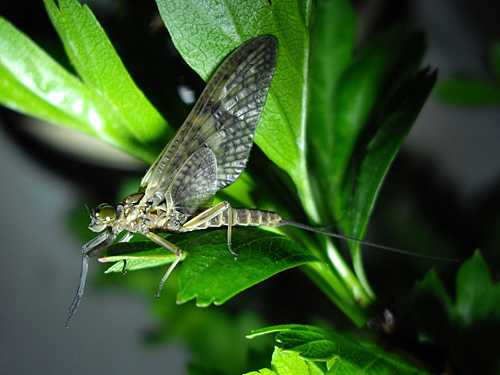 Briefly lost control of his dry fly and as it dragged at bit across the tail he hooked and then lost a salmon. 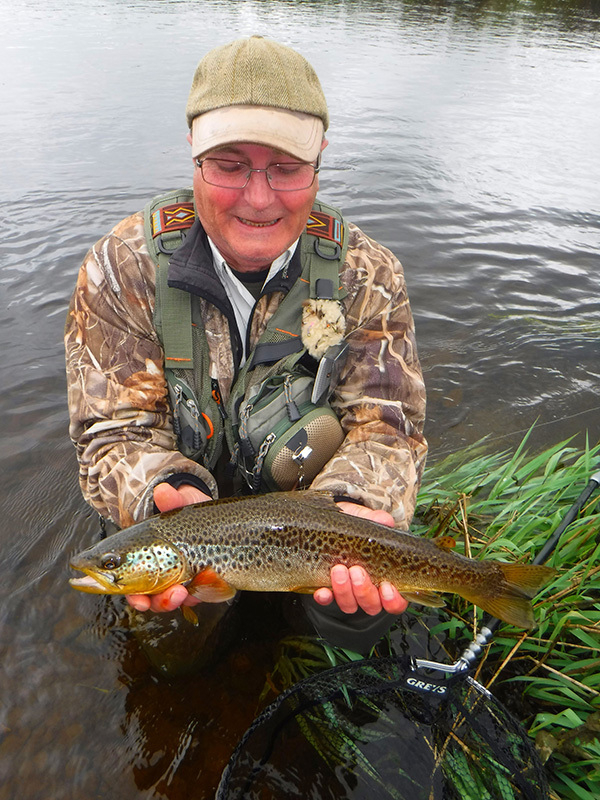 Returning the next day, and in the same place using a Stoats Tail he hooked and landed.................... a very nice Brownie. 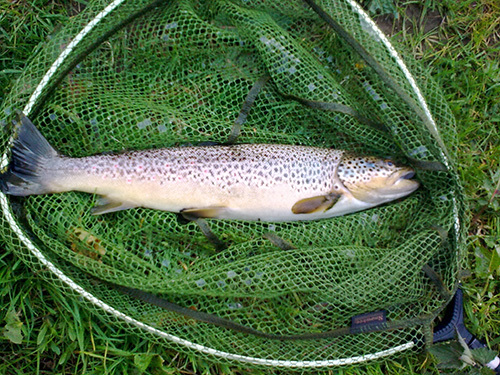 Its a daft game still! 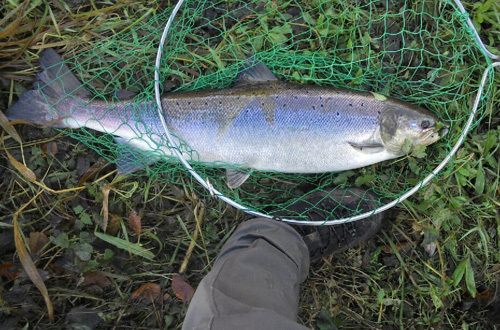 Of course not all the fish catchers in the river abide by the rules!!! 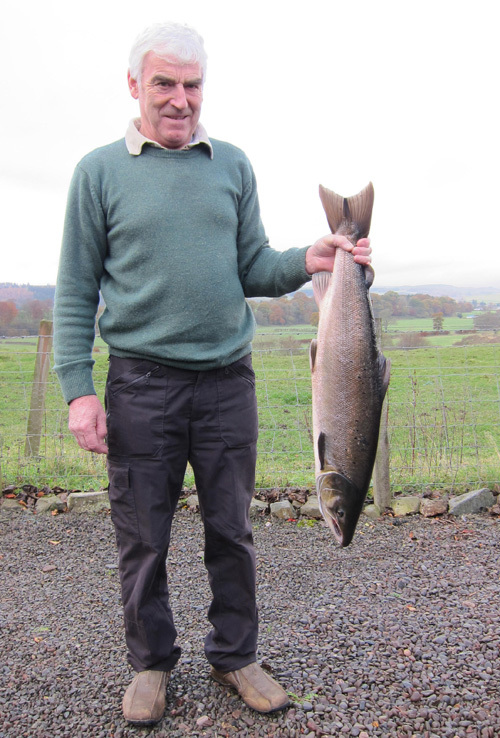 27 pounder!! 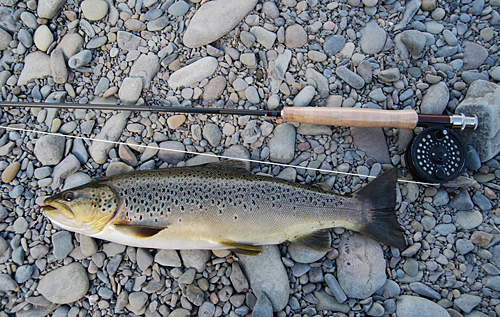 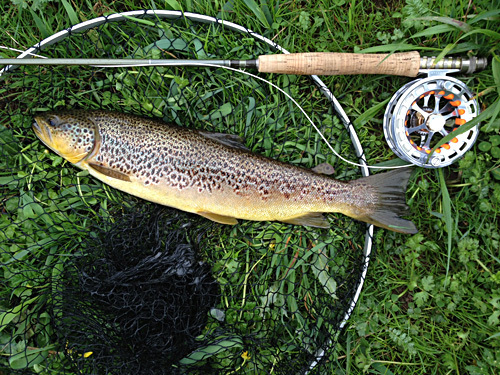 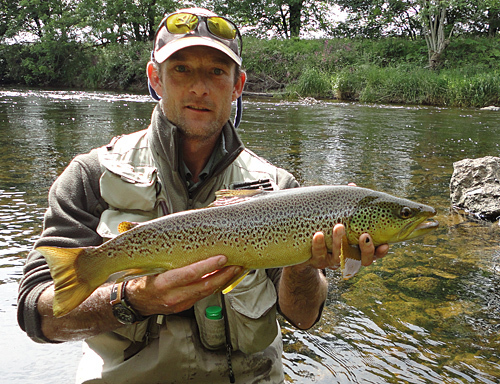 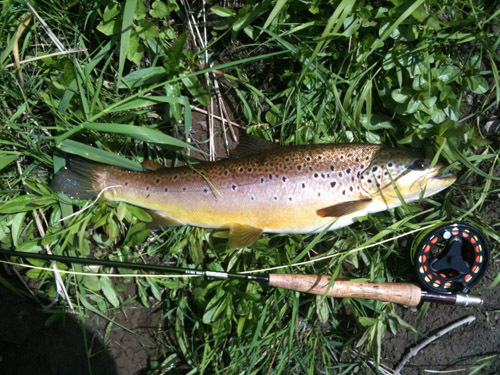 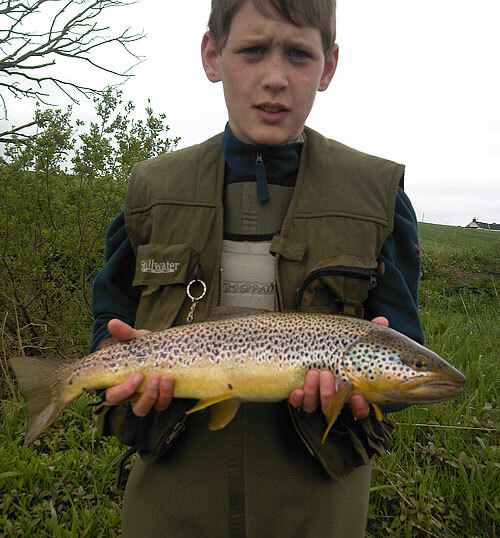 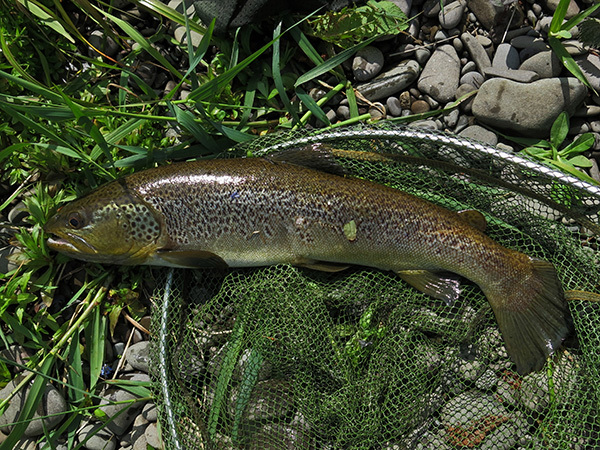 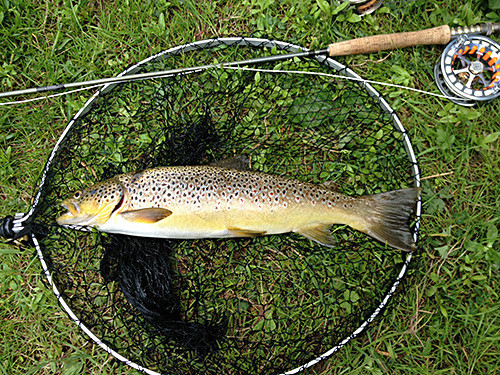 Andrew Crozier, Brown Trout around 9 pounds, Silver March Brown. 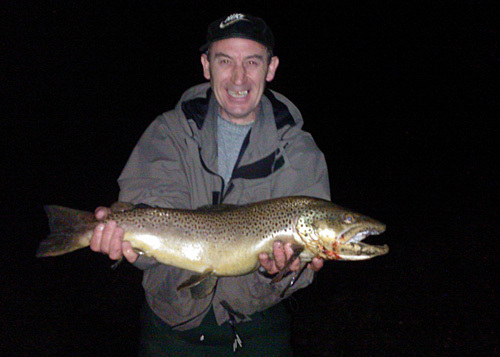 Plum pool on the Upper Beat around 1am 19th July, 2012 - Andrew seems a bit pleased! 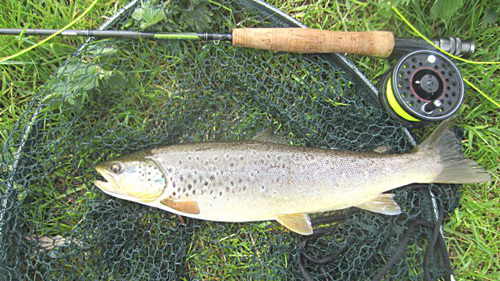 Visited Applegarth Beat 13th to 17th June, 2011. 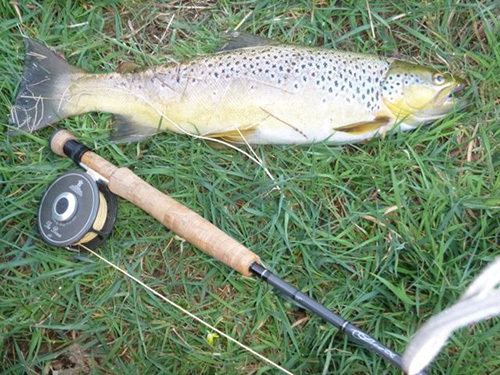 Had Sea trout at 9 pounds and 5 1/4 pounds and a Brown at 5 pounds, all on beadhead and all returned. 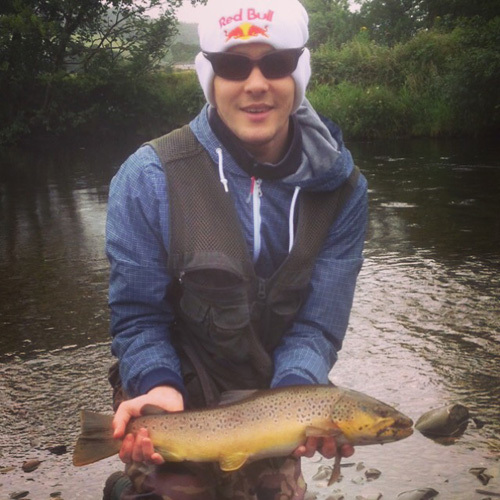 Ended his first summer after trout on the Annan with a neat little half pounder in the Meetings hole. 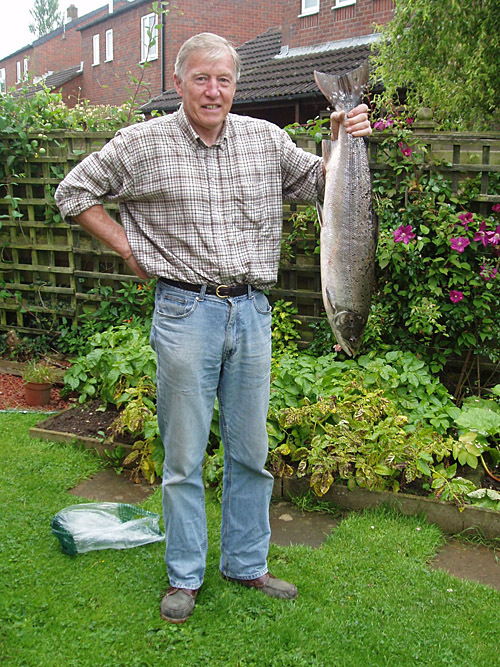 I'm now expecting to see pics of salmon Dave!! 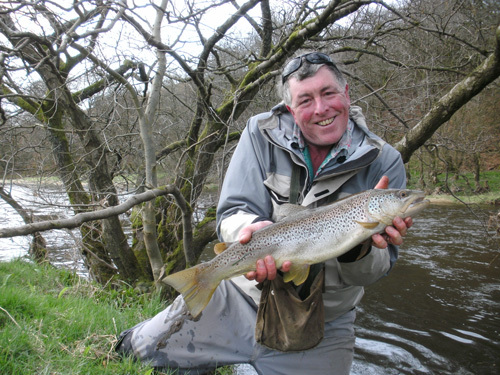 Paul Cosgrove had a GOOD day Applegarth Beat 15th May, 2010. 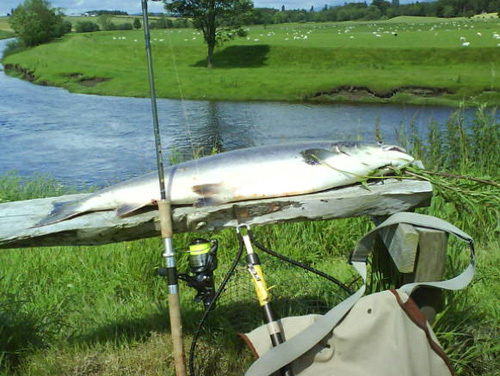 Fish were 22", a fairly thin 24", a heavy 23" in cracking condition, and a "mere" 19""
Lost a Grilse on Upper Beat in the morning, 7th July, 2011 and moved to Applegarth. 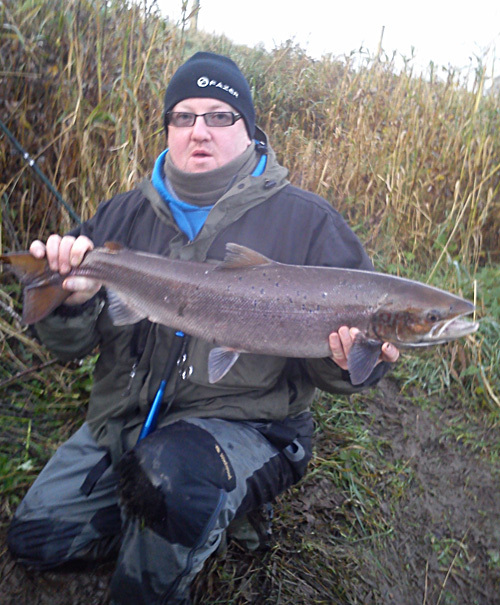 Rapala at Fourmerkland 20 pound salmon and it is a corker!! 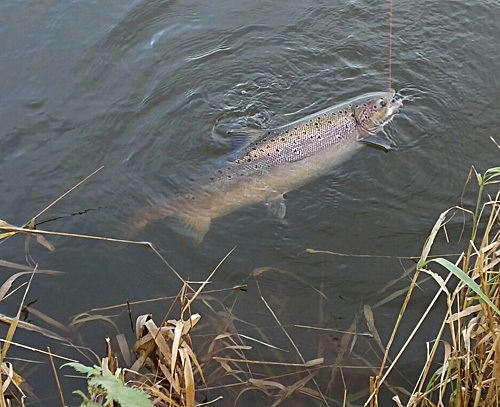 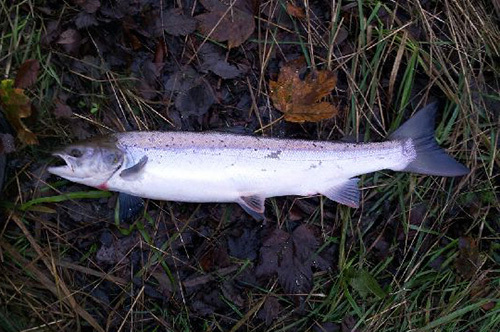 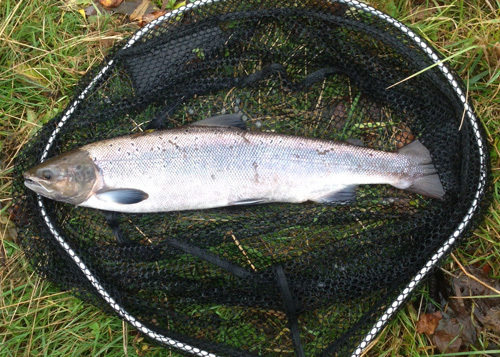 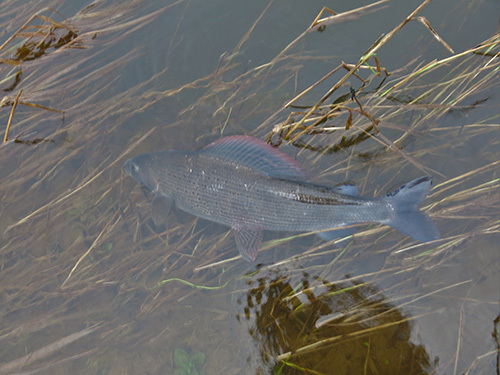 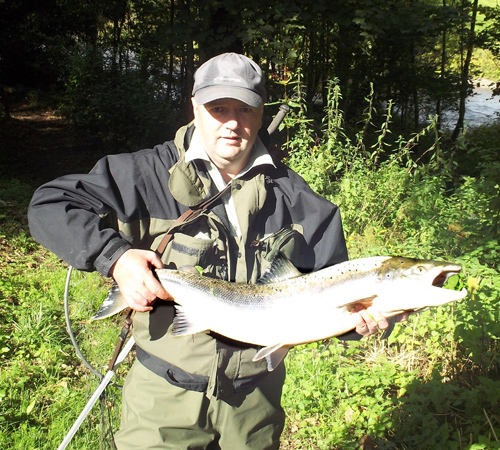 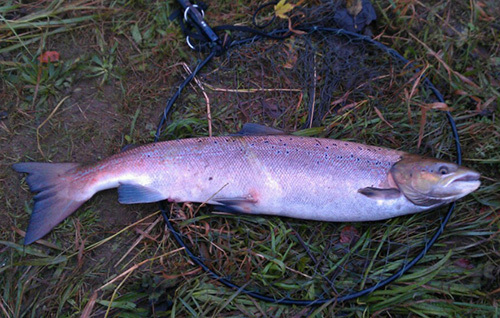 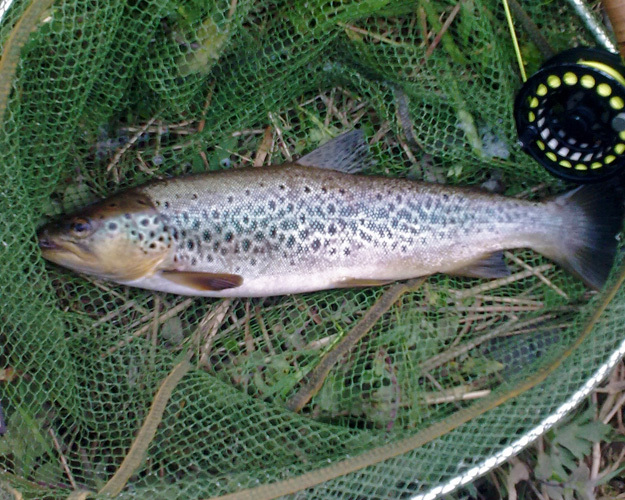 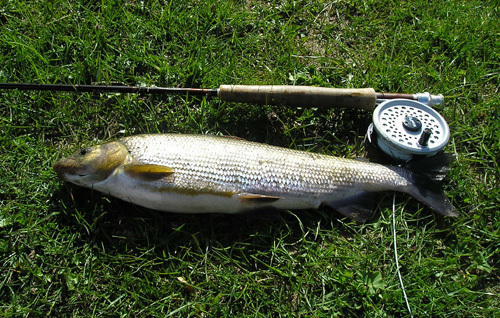 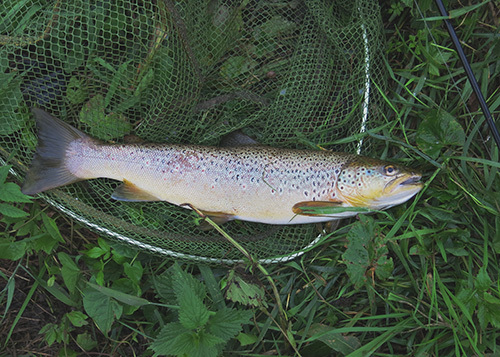 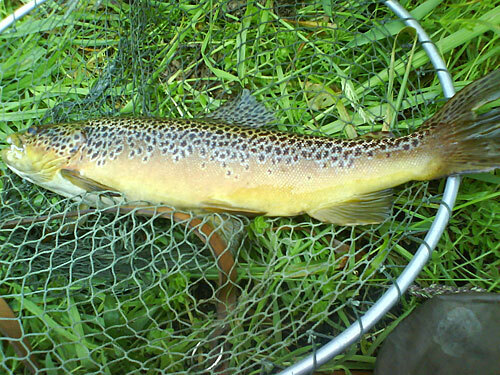 Woodhead Scaur, Upper Beat, 15th October, 2011, nice fresh 6 pounder hen fish on a size 12 Ally's shrimp returned. 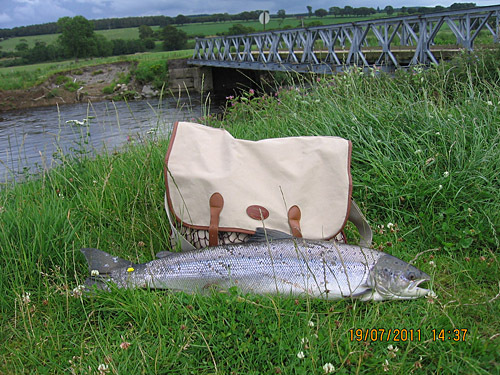 "River heaving with fish"
Upper Beat, 13th September, 2011, nice 7 pounder salmon on a baggie. 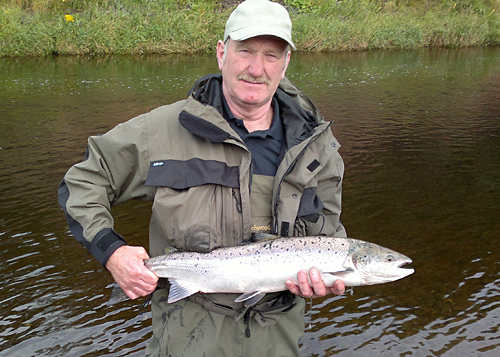 Poldean on Upper Beat, Wednesday, 17th August, 2011, 9 pound salmon on an Admiral Nelson tied by "Malky" Returned. 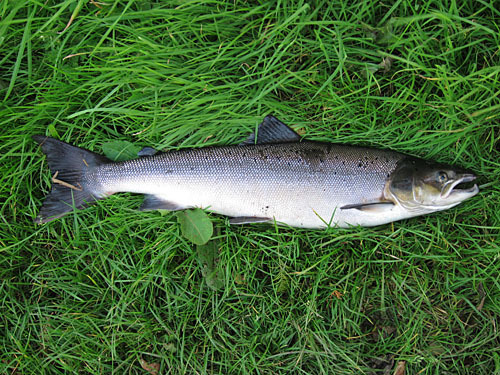 Lost a similar fish later same place. 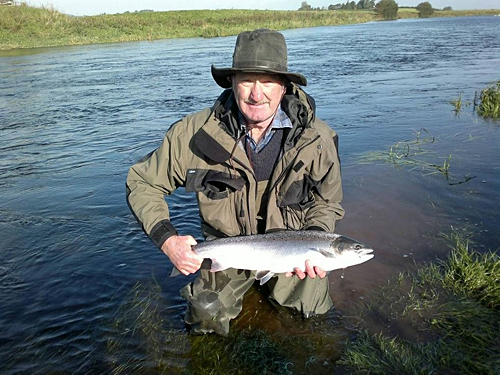 Paterson's Stream on Upper Beat, Monday, 15th August, 2011, 11 pound salmon on a size 12 Cascade tied by Andy Banks. 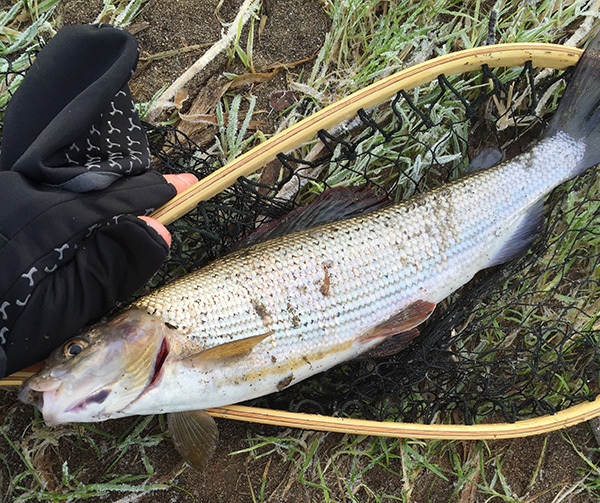 Returned. 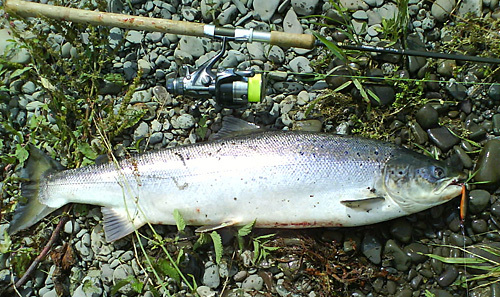 Applegarth Beat near Archwood, Tuesday, 19th July, 2011, 11 pound salmon on a Toby. 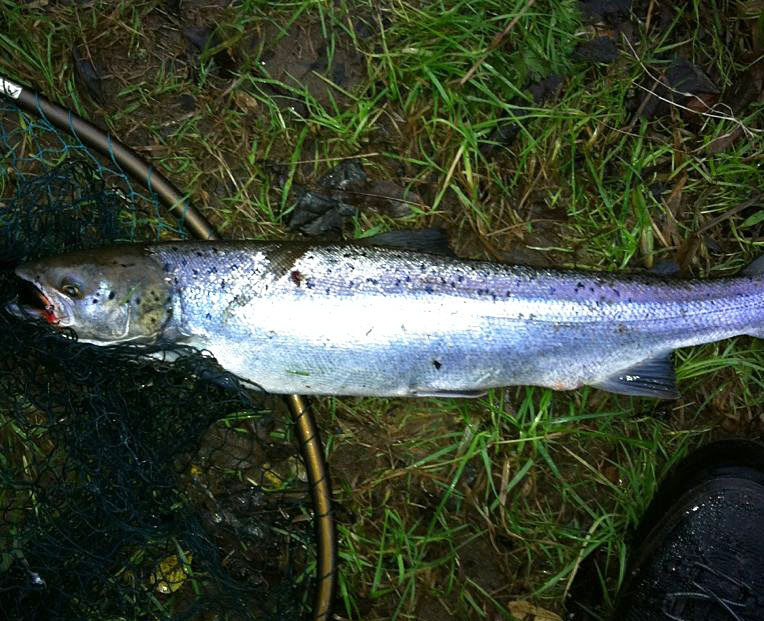 Hoddom, Monday, 26th September, 2011, Flying C, 15 pounds sea liced. 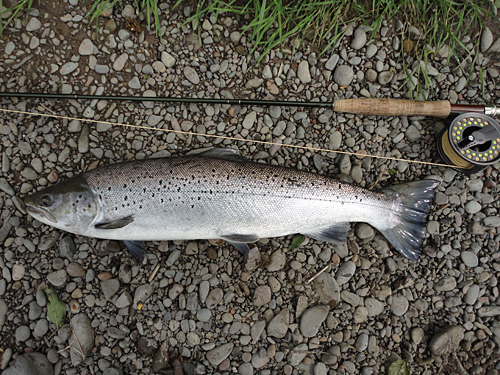 Good run of fresh fish passing through, some big ones. 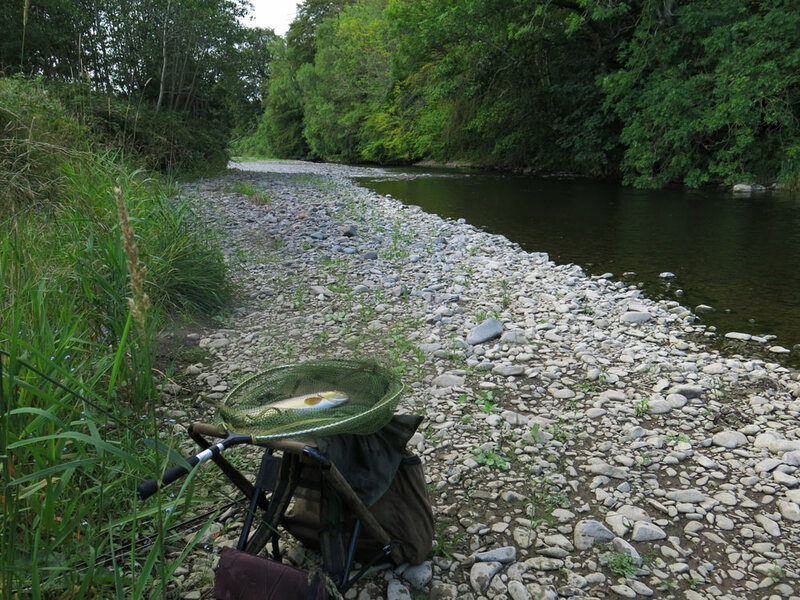 Mark Watson, Upper Beat, Meetings Pool right at the head of the river.